I Know of Beauty That no one has ever Known The question is: “what would you do if you could do anything?” I would like you to see what invisible means. You have made this day a national holiday named after him. A good man. A great man. A righteous man. The question remains: Where do you go from here? Chaos or community? Love, a concerned citizen of Canada. “If my dear pet can’t be with me, then I can’t be there.” Source: Franciscan Media Image: CIA de foto. Looking for a story, this is what I found. 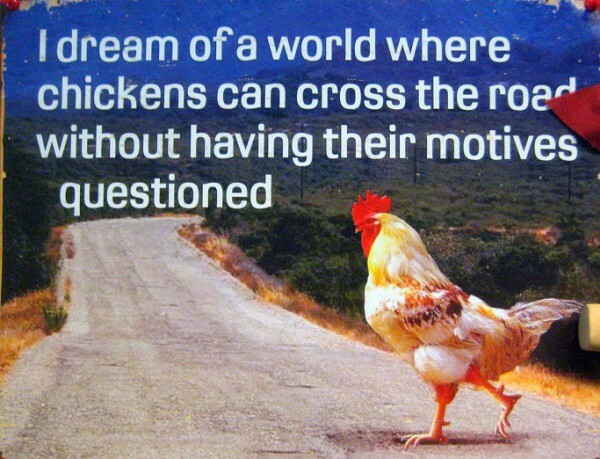 I will never ask why the chicken cross the road from now on.